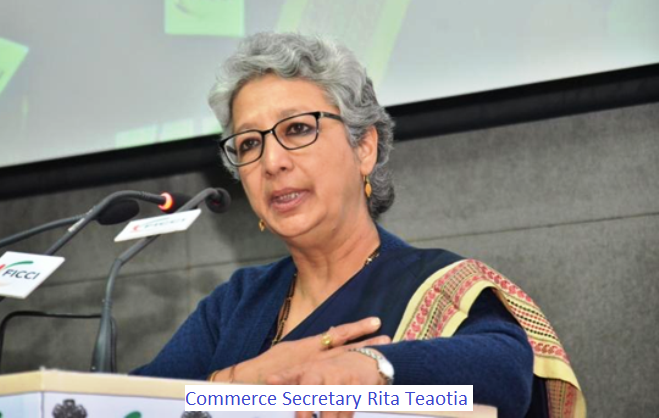 Speaking at the inauguration of India Engineering Sourcing Show at Chennai , Commerce Secretary Rita Teaotia said the exports to developed countries are growing at a rapid pace and are expected to see a new high in the current financial year. Exports from the engineering sector have registered 22% growth to USD 62 billion during the April-January period of 2017-18. Shipments to North America and Europe account for about 40 per cent of the total exports from the sector, Rita Teaotia said. The share of engineering exports in the country s total shipments has increased to 23.6 per cent in 2016-17 from 18.2 per cent in 2009-10. Teaotia said that government initiatives such as 'Make in India', 'Start Up India' and 'Digital India' would further boost the growth of industries in the country. Emphasising on the importance of the growing services sector, she made a case for recalibrating the traditional model of manufacturing led development. Teaotia said the services sector matters greatly for enhancing competitiveness of the manufacturing sector and also accounts for a significant portion of the value added in a product. The boundaries between manufacturing and services are "increasingly blurred, requiring us to recalibrate our traditional model of manufacturing led development," she said here. Global mega trends such as Industry 4.0, changing dynamics of the global value chain, rise of shared economy are presenting both opportunities and challenges to the country, she added. Teaotia said that long term enablers that focus on job creation by harnessing these mega trends and business models at the intersection of services in manufacturing will be key to future development. Speaking at the event, EEPC India Chairman Ravi Sehgal said that the exports may reach USD 100 billion in the coming years. Czech Republic Industry and Trade Minister said that huge opportunities exist between the two countries to increase economic cooperation. The bilateral trade between the countries stood at over USD 1 billion.